On Thursday, Hockey Canada will announce the roster for the 2018 Winter Olympics. Ahead of the announcement, there was speculation that Hockey Canada would extend an invite to Colorado Avalanche prospect Cale Makar. The 19-year-old defenceman just helped Canada win gold at the World Juniors (eight points for the tournament) and was named to the tournament All-Star team. 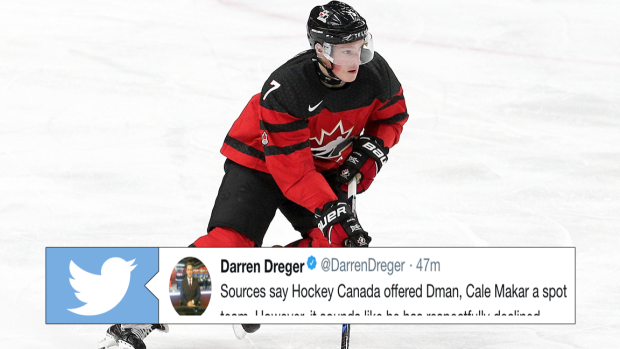 Fans that were looking forward to seeing Makar possibly represent Canada at the Olympics didn't get their wish, though, as Darren Dreger reported he respectfully declined the opportunity. Sources say Hockey Canada offered Dman, Cale Makar a spot on the Olympic team. However, it sounds like he has respectfully declined. Obviously this comes as a shock to some and there were a lot of reactions from hockey fans once the news broke. He would likely be a 7th D, PP specialist and have a minimal role. Also, aside from hockey, he also is a student and is likely already behind in his classes due to WJC. He'll would be lucky to get high single digits in ice time, if play at all. All in a low end Olympic hockey tourney. Topple that with at least 3 weeks of lost time playing meaningful hockey with his school just to sit in the press box. I have no problem. Guys in university and already missed a month cause of WJC I respect it. The comments here... It's a crappy tournament where he'd get little ice time. Go back to junior after WJHC and play top minutes, develop your game. Understandable since he's in school, can't lie though would've liked to see him there. Can't wait to see him in an Avs sweater! How can you respectfully decline a Call up to represent your country? If Cale Makar went to the Olympics for Team Canada, they'd play him as a No.7 D at 5v5 with PP minutes (similar to the World Juniors). Reports that Cale Makar said no to Team Canada for the Olympics. Interesting. As Bob McKenzie said, it's Makar's call and at the end of the day we should all respect his decision and wish him luck as he works towards a long and successful NHL career with future Olympic appearances.